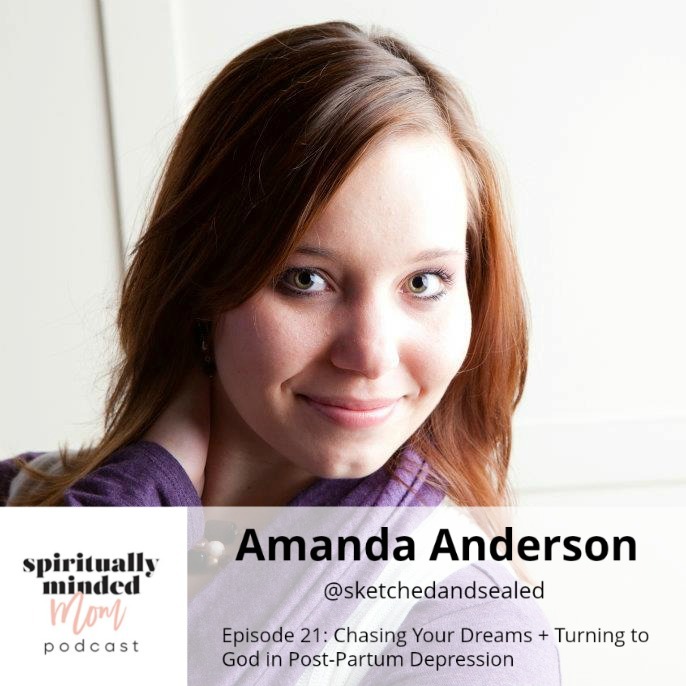 My guest for episode 21 is Amanda Anderson. Amanda is an artist and has a business, Sketched and Sealed, painting personalized artwork. She is a wife and mom to three children ages 6, 3 and 10 months. She believes in chasing your dreams and is currently pursuing a degree in architecture. Amanda recently shared on her Instagram account about the extreme post-partum depression she experienced after her second child. She has a beautiful story about how an involuntary admission to a mental hospital helped her turn to God as well as reach out to those around her who were also struggling. God helped her come out of the darkness she felt, and I am excited to share part of her motherhood story on the podcast. Amanda mentioned the Personal Progress program as something that helped her during her stay in a mental health hospital. Personal Progress is an achievement program for young women in The Church of Jesus Christ of Latter-day Saints. Go here to learn more. We mentioned this quote by Thomas S. Monson, ““The present is here. Live in it.” You can read more by going here. Amanda highly recommends the book The Mother in Me by Kathryn Soper as a resource for all moms as it helped her greatly during her battle with post-partum depression. 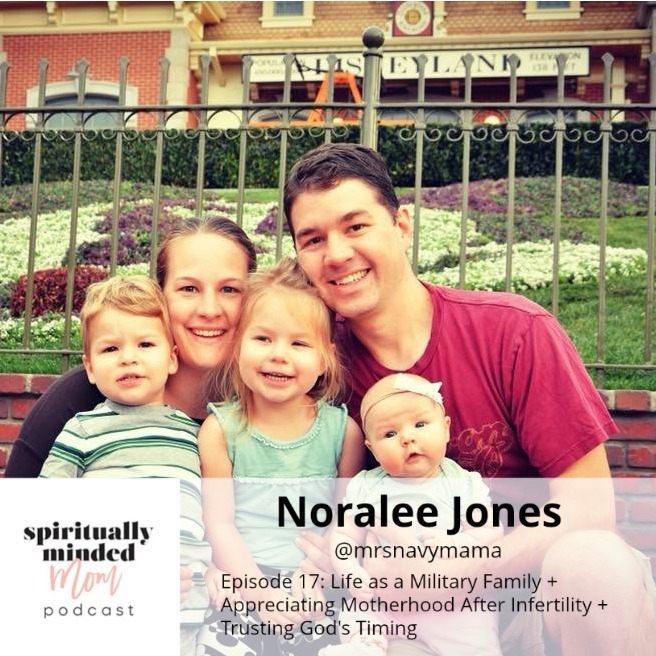 My guest in episode 17 of the Spiritually Minded Mom podcast is Noralee Jones. Her husband is a naval officer, they have three children under the age of 4 and they just moved to a new state. She goes by Mrs. Navy Mama on social media and writes on her blog about motherhood and life as a military family. Her motherhood story includes infertility, parenting on her own while her husband is away, moving frequently and trusting in God’s timing. In this episode, Noralee shares about the six year struggle she and her husband went through to have children and what she learned from that time in her life. She describes what it’s like to be a military family, which means moving about every two years and having her husband away more than half of the time. Noralee gives her top three things for getting through the hard days of overwhelm and loneliness. (Hint: one of them is chocolate!) She also talks about her take on self-care and how it’s not selfish for a mom to spend time away doing things she loves. To combat the loneliness and isolation of motherhood, Noralee recommends “finding your tribe” and “joining the group.” To other mothers who struggle and feel alone, Noralee’s advice is to not judge what you think people are thinking about you because you don’t know what they are thinking. At the end of this episode, Noralee talks about the “game changer in her testimony on faith” in motherhood. I was surprised to find that it wasn’t infertility. Initially, this trial made her feel selfish and terrible but ultimately led her to trust Heavenly Father and His timing. Noralee sees God’s hand in her motherhood in the ordinary, everyday things and knows her work as a mother is divine.